ENTER PLANET CUTE!! 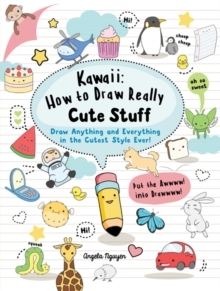 !Kawaii: How to Draw Really Cute Stuff teaches you how to draw anything and everything - people, animals, food and everyday objects - in an adorable manner. You don't need any specialist tools or materials to start drawing cute stuff: all you need is a biro or marker pen, then you're ready to go!With artist and illustrator Angela Nguyen, start by learning the techniques of kawaii through quick and easy exercises on the basic shapes, effects and style. You can then dive right into making your kawaii characters, as the step-by-step, how-to sequences inside make drawing cute stuff really simple. A perfect book for beginners - add cute-appeal to any drawing in no time at all!